I am experimenting with spit bite with mixed results. I am worried that I’m picking up patterns from the blanket in the image. I want to get smoother gradations like I see in your prints at Crown Point. I particularly like Pat Steir’s Mixed Marks, Landscape and Moon Lake. Maybe I am doing something wrong. Maybe with putting on the rosin? I’m using ferric chloride as the etch. What do you think? There is a good chance that your blankets or the way you have set them up may be causing the problems you have been having when printing a spit bite plate. The best blankets to get are woven 100% wool felts. It is important that the weave of your blankets is as tight as possible as a strong weave will be transferred to your print. Generally, we only use one 1/16″ blanket and one 1/8″ blanket when printing. 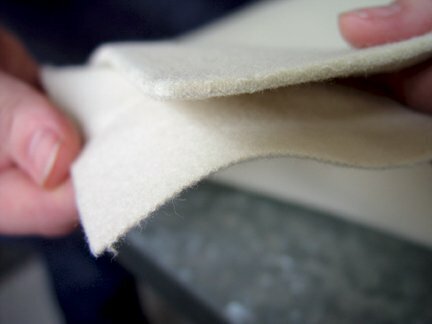 We find that using the traditional thick 1/4″ pressed felt pusher blanket along with the other two blankets is not necessary and actually yields a weaker impression. You may want to try stretching the blankets out a bit before printing your plate. Clean blankets are generally a little fluffy and need to be worn in to get a smooth impression. Simply run your uninked plate through the press several times; progressively lower the pressure as needed. If you’ve played around with the blankets and your printing technique your problem might have to do with the way you’ve made the plate. The way you apply and melt the rosin on the plate will largely determine the quality of your spit bite aquatint. For the most part we use nitric acid for spit bites because of its strength and ability to quickly record every gesture and mark you make on the plate. However, nitric must be used with proper ventilation because of the noxious fumes it produces. As an alternative you can use ferric chloride, which is less toxic. Ferric can be a bit more tricky to use for spit bite since it generally takes a few applications to build up a tone as rich as that made with nitric. You can learn more from my book, Magical Secrets about Aquatint. Surprisingly, the Pat Steir image Mixed Marks, Landscape that you like for its smoothness and depth was actually made using ferric chloride as the etch. Steir achieved this look by heavily pooling the ferric onto the plate and then she let the acid sit for a good deal of time to allow the acid to etch the plate as deeply as possible. Much of the tone in Steir’s Moon Lake comes from a water bite plate in the background. Steir made the spit bite marks in Moon Lake using nitric acid.